Enbridge is Pulling a Bait-and-Switch — Will the PUC Finally Take a Stand? Enbridge — the Canadian company that wants to run a tar sands crude oil pipeline through northern Minnesota’s pristine waters and wild rice areas — is getting away with the old bait-and-switch move. Late last spring, Enbridge’s Line 3 pipeline proposal looked like it was in trouble. The company made a last-minute pr move, promising to contribute $100 million to a “Tribal Economic Opportunity and Labor Education Plan” if the Minnesota Public Utilities Commission (PUC) approved the project. And with no details, the PUC bought it hook, line, and sinker. More than 50 pipeline resisters met at this pipeline storage yard in a Carlton County gravel pit Thursday to call on the state to halt all Line 3 construction and pre-construction activities until all Line 3 reviews are complete. Enbridge has several such storage yards around the state that don’t have appropriate permits. Governor Mark Dayton came out today against the Enbridge Line 3 crude oil pipeline through northern Minnesota, backing a legal challenge by the Minnesota Department of Commerce to overturn the decision of the Minnesota Public Utilities Commission (PUC). Members of MN350, the Youth Climate Intervenors and the Sierra Club stopped by Gov. Dayton’s office today to thank his staff for his support of the Line 3 appeal. In a decision that didn’t seem to line up with the facts, the PUC voted this summer to grant Line 3 a Certificate of Need and a Route permit. Line 3 will add significantly to climate damage and violate treaty rights. Oil spills from Line 3 could damage the Mississippi River and our clean lakes and streams. The evidence shows Minnesota doesn’t need this pipeline; it will only serve to help Canada’s foreign export efforts. “I strongly support my Commerce Department’s appeal of the Public Utilities Commission’s Order. “Enbridge failed to provide a future demand forecast for its product, which is required by state law. Instead, the company presented its analysis of the future oil supply from Canadian tar sands extractions. It failed to demonstrate that Minnesota needs this pipeline to meet our future oil demand. In fact, most of the product would flow through our state to supply other states and countries. 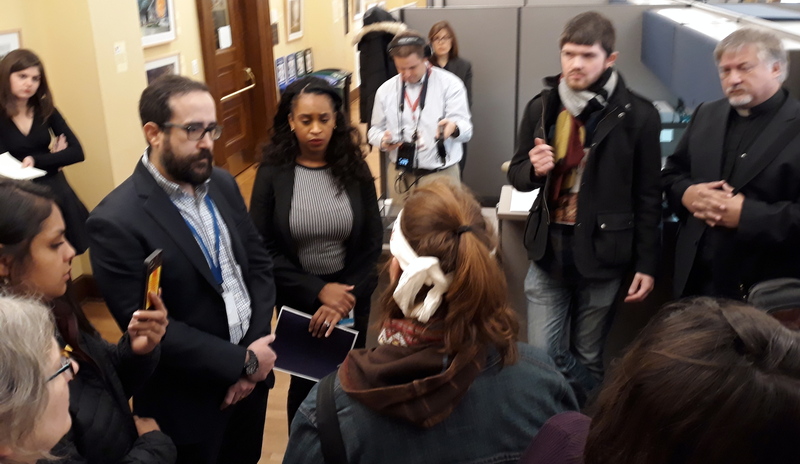 News reports often highlight when water protectors disrupt the Minnesota Public Utilities Commission (PUC) meetings or Enbridge Line 3 public hearings; they have not covered the bias and disrespect PUC staff has shown to water protectors. Those actions have undermined trust in the institution and its credibility. As expected, the Minnesota Public Utilities Commission (PUC) today rejected requests to reconsider its approval of the Enbridge Line 3 crude oil pipeline through northern Minnesota. As predictable as it was, the decision remains heart breaking. 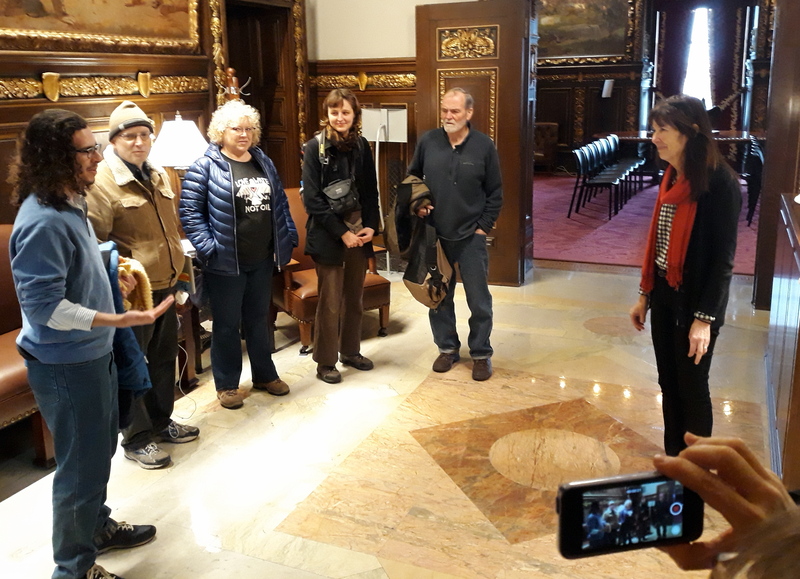 Pipeline Resisters visited with Gov. Tim Walz transition staff Randolph Briley and Alexis Kochanski after the PUC vote. Red Lake, White Earth, the Mille Lacs Band of Ojibwe, the Minnesota Department of Commerce, Honor the Earth, the Sierra Club, the Youth Climate Intervenors, and Friends of the Headwaters had asked the PUC to reconsider approving Line 3. Commissioners summarily and unanimously dismissed their request, 5-0. The PUC continued to ignore the Environmental Impact Statement’s conclusion that Line 3 would generate $287 billion in climate damage. It continued to ignore the Administrative Law Judge’s findings that approving Enbridge’s preferred route failed to meet the cost/benefit test. It continued to ignore Commerce’s conclusion that Enbridge failed to prove Line 3 was needed. It continued to ignore the impacts the pipeline would have on treaty rights. The PUC took no comments from intervening parties asking for reconsideration. The whole process probably lasted five minutes, enough time for a few commissioners to say they had already considered these issues and there was nothing more to talk about. The PUC gave Enbridge pretty much everything it wanted. It’s an example of corporate capture, where the government institutions created to protect the public get co-opted by corporate interests. Its the Minnesota version of what is happening with the Environmental Protection Agency. The Minnesota Public Utilities Commission’s (PUC’s) deeply flawed decision approving the Enbridge Line 3 crude oil pipeline through northern Minnesota likely will get challenged in court. Some of the legal arguments against the PUC are now coming into focus. It’s doubtful the PUC will budge and reverse its vote, but this is a necessary procedural step to allow Line 3 opponents to sue in court. The legal arguments contained in these motions could form the basis for future lawsuits. If this issue does go to court, the PUC will have a lot of explaining to do about why it consistently favored Enbridge and ignored public testimony and the administrative law judge’s independent recommendations. It seems like a reasonable request. Honor the Earth filed a motion with the Minnesota Public Utilities Commission (PUC) to have Enbridge make public its insurance coverage to pay for a major oil spill cleanup in Minnesota from the proposed Line 3 pipeline. Line 3 would cross the Mississippi River — twice — and pass through wild rice areas and some of our state’s cleanest waters. Citizens should know if they are covered for a major spill. At the same time, Enbridge Line 3 is forcing huge environmental risks on Minnesota, and Native nations in particular. Does Endridge’s profit interests in keeping it insurance plans secret outweigh the public’s legitimate interest to know that we are adequately protected? Honor the Earth filed a motion with the Minnesota Public Utilities Commission Thursday to force Enbridge Energy to disclose the details of the insurance it holds to clean up any potential crude oil spills in Minnesota. Enbridge has kept the information hidden, claiming it is a trade secret. It seems more likely the argument is a ruse to avoid public scrutiny of its inadequate coverage.